What do you do if, like ALL of the original 100+ serious applicants for my ‘grand experiment‘, your Number is in the millions? That means that saving anything less than 50% of your salary over anything less than 20 years is unlikely to get you there? 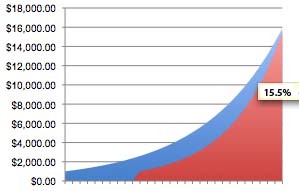 … we can get to the same end point, but only by increasing our annual compound growth rate by a hefty 55% (i.e. to 15.5% p.a.). That difference in compound growth rates could literally ‘force’ you out of nice, safe, easy Index Funds into making scary, difficult investments in individual stocks. Or, if your Number / Date combination is much Larger / Sooner, it may even ‘force’ you into investing in real-estate, small businesses/franchises, or even into starting your own high-growth businesses! So, you could just ‘go for it’ anyway … as I’ve said before massive passion drives massive action, which produces massive results …. maybe. But, what if you’re the more rational (sane?) type? How do you come up with a more reasonable target? Seems obvious and easy, right? Well, the ‘cost’ is in delaying and/or reducing your expectations for how you really want to live your Life … so, you want to consider ALL of your options, VERY carefully … fortunately, the financial-self-discovery process itself is not difficult …. You know, i’ve struggled back and forth with both increasing and decreasing the time i’ve planned to reach my number. How great would it be to get there sooner! But how great would it be to wait just a little bit longer and double, triple or quadruple the number?? I know if I can delay gratification just a bit longer, the number goes up so darn much so fast! It’s awfully tempting sometimes, lol. I think delaying also lends itself to delaying action, thinking there is plenty of time. I myself would be more willing to wait at the end of my time period if I feel I am on the right track, knowing I worked hard to get there, than to find myself two years later at the same position because I had dallied the first two years…which, given the compounding exercise above, really would not have me in the same position (waiting two years to start). Does that make sense? The younger we are, the more time we think we have. It is only as you get older than you realize time is relative. @ Diane – Compounding curves require just as much return on Day 1 as on the second last day, so you are right … time IS of the essence. Diane, I think you misunderstood me. What I meant from my comment above was to keep cranking out your growth engine longer(if your date is in 5 years, don’t stop at 5. Delay gratification a couple more years and then end with 3 or 4 times your original number.) Not take any breaks, or coast. The opposite, actually. Keep the pedal to the metal a little longer. Not that i’m suggesting anyone do this. Heck, you only have one life and i’m sure you want to start living it according to your life’s purpose ASAP! But the old principle of delayed gratification is mighty powerful and awfully tempting! To me at least. Every wonderful thing or attribute I have in my life was product of delayed gratification. I wasn’t disagreeing with you, Scott. I was pointing out to the younger readers (20-something year olds, if they’re reading this)that when we’re young, we all think we have plenty of time. Actually it’s all relative. When I was younger, an hour could last a month nowadays and here I can blink and 3 months has gone by. As the song goes, “Time is Fleeting”…3 points for guessing the next line? P.S. I was 24 twenty-four years ago today. Makes you think. @ Diane – Yep, sounds like you and Scott are on the same page; and, you and I are of (approx.) the same age :)) My point to Scott on his last post making the same point: aim for your Number, Date … by the time, you ‘unwind’ your active affairs and turn them into passive, you will probably ‘overshoot’ anyway …. else, I agree with Scott: we want to delay gratification and build a ‘buffer’ into our Number so that we can weather 50% market downturns.